In the past, Search Engine Optimisation (SEO) and “doing well in Google search” was all about ranking high in Google for those few high opportunity keywords; where high rankings meant lots of visitors and ultimately sales. How you acquired those rankings was a game that was, for the most part, played fast and loose. It was all about gaming the system and manipulating Google rankings with paid and manipulative link building. That singular focus is what built an industry of outsourced, scalable, manufactured links to drive rankings forever higher. With Google’s improved ability to detect and punish artificial links, people have realised that ranking for a few high volume keywords leaves their businesses woefully exposed to financial ruin from lost rankings, traffic and sales. Also page 1, position 1 is no longer the valuable ranking that it once was. As Google has changed the face of search results with Universal search results that include images, videos and news and the increased visibility of local maps listings, the default organic listing is pushed further down the page. And let’s not forget the increased space taken up by sponsored paid listings on the top of each page. For many search queries, the first organic listing is now below the fold of the page. To help people understand a better, safer, more sustainable approach to seo, I found myself using the term “Online Visibility” to describe an approach to SEO that focused on getting found for many more keywords that just the few high volume ones that exist in every market. The concept is nothing new. We’ve always talked about the long tail of keywords, but I find by using the term Online Visibility, I can more easily have discussions with people about creating content that helps answer questions that prospective customers have, way before they even realise they need your product or service. Online Visibility is about getting found wherever conversations are happening that are important to your customers, industry participants and your business. Rather than focusing on trying to be #1 for a few big keywords, smart businesses should focus on being visible online for the many keywords and phrases used by prospects and customers who have a problem or a need and are looking for solutions. 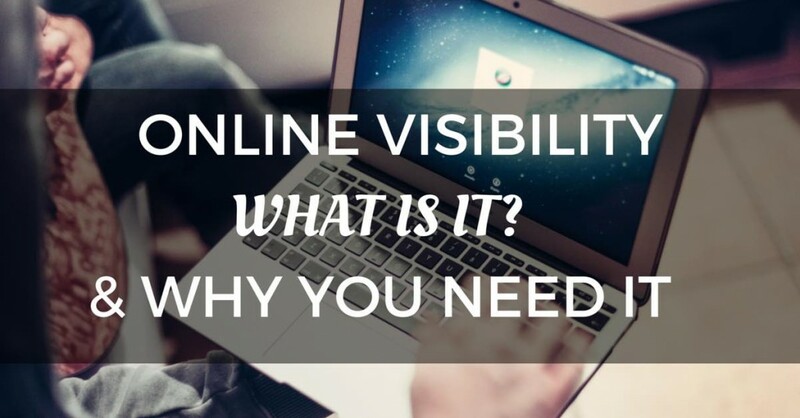 So What does Online Visibility actually mean? It means that when people have a problem that needs solving and they go online to do their research, your website comes up. It means that when someone in your market wants to share a great resource with their audience, that the resource is yours and it sits on your website. It means that when people share interesting and unique stories and other content on social media that it’s your content getting shared. What are the benefits of having broad online visibility? If you do those things that increase online visibility here is what you should see. And if you are good at converting your increased inquiries your sales should also be increasing. In this 12 minute video from my online training program, I explain all you need to know about measuring and growing your online visibility and benefitting from it. Need Some Help Increasing Your Online Visibility? I help businesses increase their online visibility by taking them through a process that ensures all of the core SEO technical issues are addressed, that they are targeting the right people online, that they are acquiring the foundational links that Google expects to see and then by helping them develop and implement a content marketing strategy that helps attract links, increase conversions and build online authority. It’s hard to understand sometimes if the percentage rate of your website’s SEO is good, yet the visibility of the website is poor. It’s nice to address such issues for readers to understand. Thank you. Thank you for this valuable content related to online visibility. You explained the term in the most simplistic of ways. This whole thing is very new for me because I just started my own blog. So I am gathering as much information as I can and your website helped me a great deal. Thanks so much for this post.